A delicious, creamy, chunky and wholesome cream of potato soup paired with a tasty chicken salad pita. Wash and peel all of your potatoes and dice them into medium-sized cubes. Finely chop 1 onion, use 1/2 for your soup and the other half for your chicken salad. Take 2 tbsp. of butter and begin melting it in pot on low heat, add 1 tsp. of parsley, 1/2 chopped onion, 1/2 tsp of garlic powder and 1 tbsp. of light olive oil. Sautee the onions until almost transparent. Switch to medium heat. Add chopped potatoes into mixture and stir until fully covered. Add water until potatoes are covered and let it come to a rolling boil. Add 2 tbsp. of bouillon and stir until dissolved. Once it has boiled, add 1/2 of the sour cream container. Stir well until dissolved. Let it come to a complete boil, making sure you stir often. Add 1 cup of milk, stir and bring to simmer on low heat. Once the soup has thickened, it's ready! For pitas, season 4 chicken breasts to taste, bake and chop into cubes. Add 4 tbsp. of mayo into cubed chicken breast, add Spike, salt and pepper, 1/2 onion and mix until chicken is fully covered. 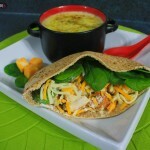 Cut pitas in half, fill with chicken salad, spinach and cheese. TIP: When you reheat, add more sour cream and then more milk to make it to the consistency you want as it will thicken if it sits overnight. I use Spike seasoning when I mix the chicken and mayo together. I also sprinkle it on my potato soup. It's delicious!